In this article we want to draw your attention on LG T370 Cookie Smart firmware, and how to install it. We have full list of firmware for this LG smartphone, and you can use it for free. LG T370 Cookie Smart phone was released in 2012. The smartphone is equipped with a color touch screen with a resolution of 240x320 pixels. It comes with 2-megapixel camera and allows you to take images with a maximum resolution of 1600x1200. 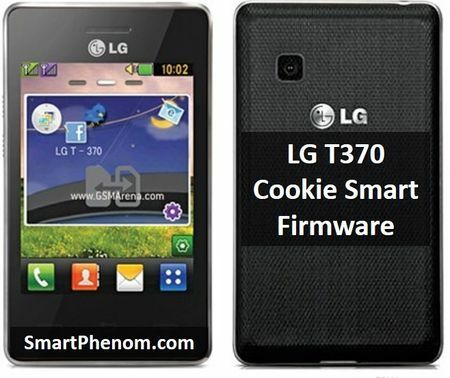 LG T370 Cookie Smart has 50 MB of internal memory, supports microSD memory cards (TransFlash). The device is equipped with Li-Ion battery with a capacity of 950 mAh, which allows for a continuous conversation lasting up to 14 hours. Among other features of the phone can be noted Bluetooth support (with A2DP profile), MP3 player, FM radio and JAVA-applications. And now we can talk about LG T370 Cookie Smart firmware, links to download and tutorial how to install. You can download firmware and DLL file from mega.nz cloud, using this link. The firmware was released in 2012, but you can use it to restore your smartphone, and fix some software errors. Unfortunately, LG T370 Cookie Smart is old enough, so actual firmware does not exist. If you have any question about LG T370 Cookie Smart Firmware, please write in comments below. We’ll try to help you.